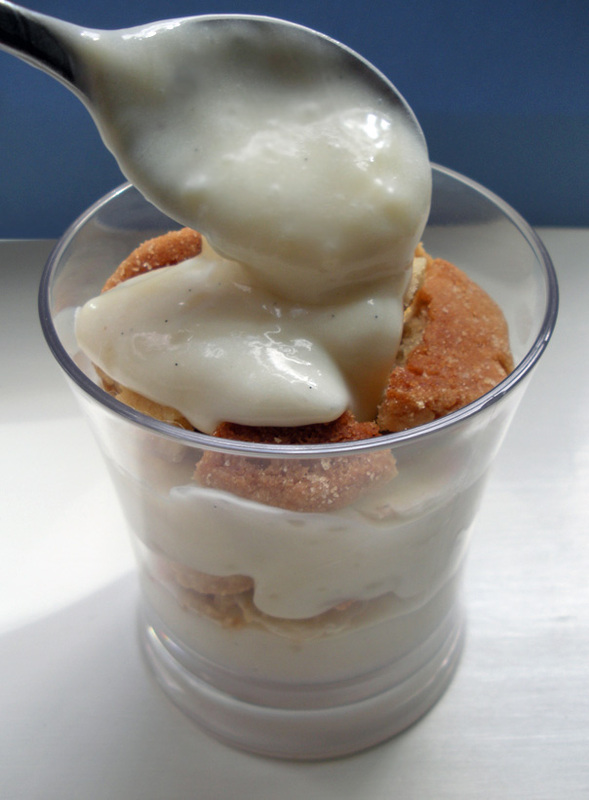 When I step into a bakery, I often look right past the popular cupcakes and cookies and opt instead for a cup of banana pudding. Smooth and creamy with a bit of crunch from the vanilla wafers…what could be more satisfying? This version is 100% vegan with soy milk, soy whipped cream, and vegan vanilla wafers. It makes about four servings. Combine the sugar and corn starch in a small mixing bowl. If you are using a real vanilla bean, cut it in half the long way, scrape out the inside, and add that to the sugar mixture. Heat the soy milk in a small saucepan. If you are using vanilla extract, add it to the soy milk. Stirring over low heat, slowly add the sugar mixture to the soy milk, mixing to combine. Continue heating and stirring. The sugar should dissolve and, after a few minutes, the mixture should thicken to almost to a pudding consistency. 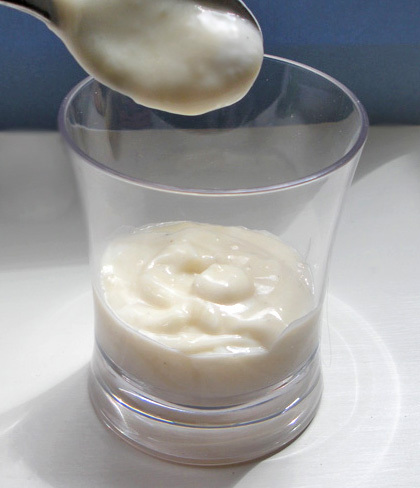 Take the pudding off the heat and allow it to cool for a few minutes, then move it to the refrigerator. It will continue to thicken as it cools. 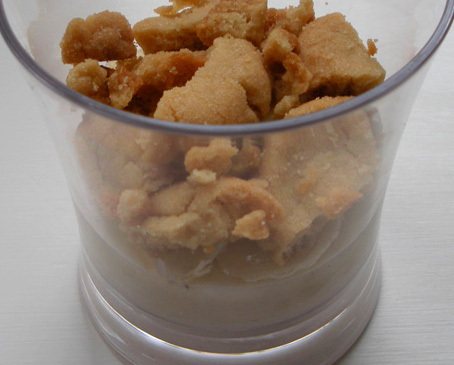 If you haven’t already, crumble the wafer cookies. I put mine in a ziplock bag and hit them with a rolling pin. 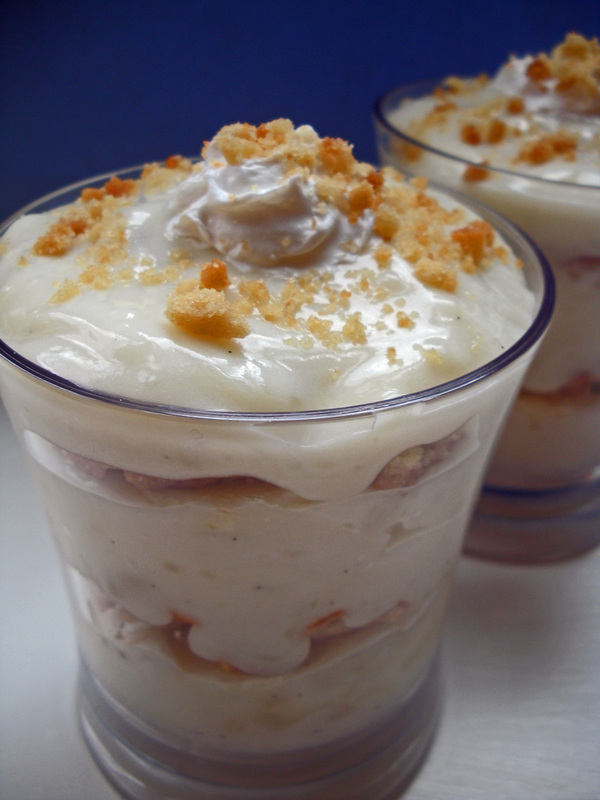 When the pudding is completely cool, take it out of the refrigerator and add about two cups of soy whip. Mix to combine. 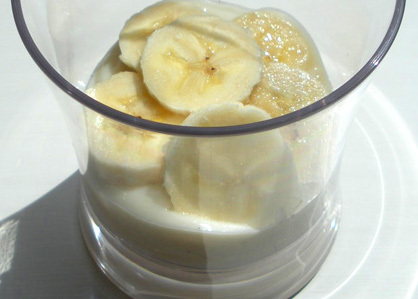 Assemble the pudding in individual glasses or in a larger glass bowl. I topped mine with a bit more whipped cream and some cookie crumbs. Keep in the refrigerator until ready to serve. Oh my goodness…this brings me back to my childhood. My mom used to make this all the time! I’m glad! 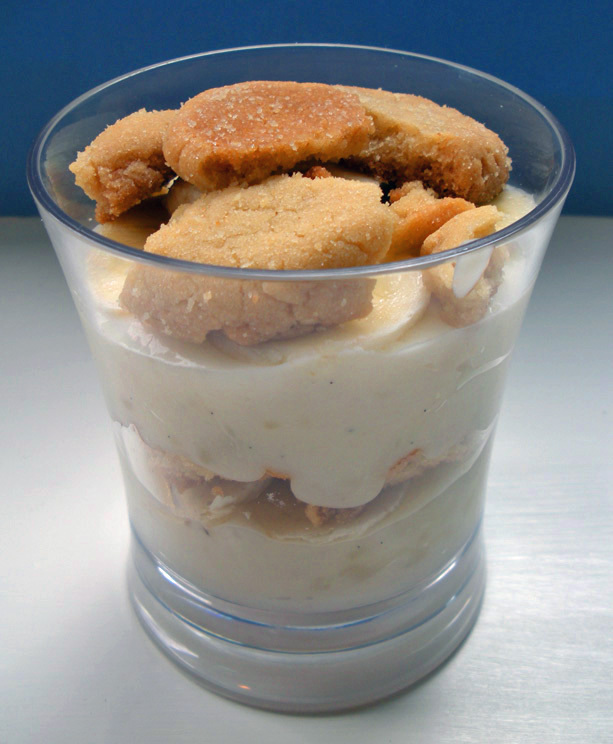 My mom used to make “dirt pudding” with chocolate wafer cookies, but no banana. Where in the world do you find vegan vanilla wafers? 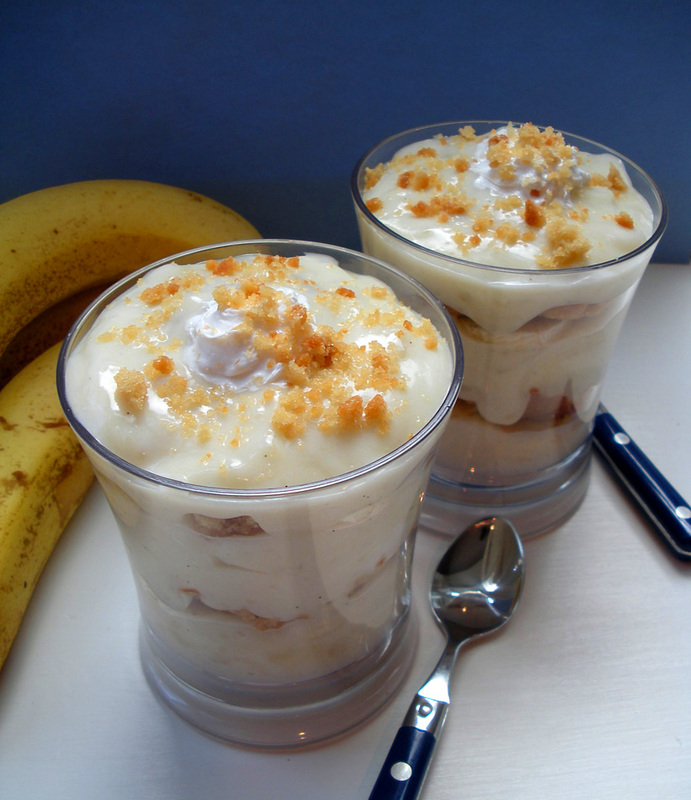 Banana pudding is my favorite and this recipe looks DELICIOUS! April 29, 2012 ~~ I’m not a cook in any way whatsoever but I am trying to make this recipe for my vegan daughter. I am about a third of the way into the preparations. I need to know at what point the Earth Balance comes into play. It is on the list of ingredients. In the directions there is no instruction on where or when to add it. Do I not need it? A halfway decent cook would probably know, but I am clueless; your help would be appreciated. Thank you! Oh, I’m sorry! That was an oversight on my part; there’s no reason you would know. I mixed a tablespoon of Earth Balance into the pudding after it thickened and before it cooled. It added a little bit of salty flavor that I thought brought out the sweetness, but it’s not totally necessary. So if you left it out, you should still be fine.